So we’ve already established that I'm an R.E.M. fan. We have also confirmed that I’m a sucker for a cover. So you didn’t honestly think I was going to sit idly by after yesterday’s R.E.M. 's news now did you? 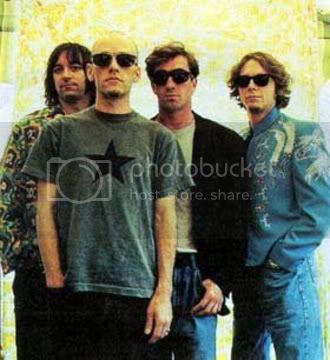 My love affair with R.E.M. has been vast and consuming for much of my life. My brother jokes I’m still listening to all the same bands today that I loved 20+ years ago and that’s true – but not because I’m not out discovering new stuff -- but because I am, above else, a tREMendously loyal fan. And for Stipe, Buck, Mills, and Berry I will REMain a loyal fan – seeking out and supporting any additional projects they undertake (I’ve already written about one project Peter Buck contributed on, the pretty little record Fall Back from Joe Adragna). When I put all of my R.E.M. memories in a bucket there’s one that sticks out pretty prominently. For my birthday a good friend got me the 1991 movie R.E.M. This Film Is on movie (on VHS of course). Growing up in a house with no cable (hence no MTV) this was the first time I got to see the faces of this band I loved so much. And see their faces I did. I must have watched that movie nearly every day after school. I thought Michael Stipe was handsome (still do) and I was completely mowed over by Mike Mills' voice. Typically taking a backing vocal role, I had never really noticed the unique Mills sound until this movie, which gave us Mills singing lead vocals on the Troggs cover “Love is All Around.” This was my first introduction to the Troggs, which sent me on a tailspin rummaging through my parents vinyl collection where I then discovered the Beach Boys, the Monkees, the Turtles, and Fleetwood Mac. In those bands I was finding lots of friends and first loves, and R.E.M. kindly played matchmaker.